Interesting figures, including the disappearance of the email (I do not believe in it) and especially the better ROI of social media in terms of advertising. After few years spent with the same design, I wanted to change my website in order it to be more simple and accessible for all devices. 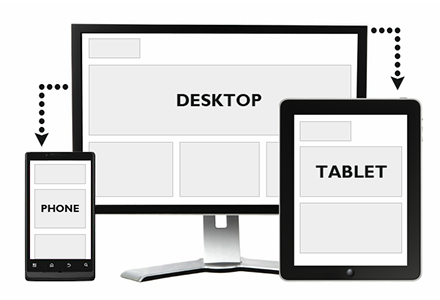 This new responsive design reaches both objectives. 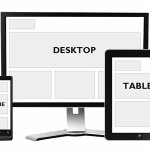 You can now browse this new version with all your devices: smartphones, tablets and desktop computers. Facebook announced this week the new timeline pages, here some stuffs to know before switching your page. Contact : Your “fans” can now directly contact you in the page (in the right corner). Good to improve the interaction with your fans. Timeline : You can now have access to all your previous status, and create milestones to show the history of your brand/company. It’s a very good way to create story telling. Tab : The old tabs are now in the top of your page, but only 4 are featured, you can create image to illustrate them (another way to customize your page). You can not anymore create a landing page, now Facebook force you to have the timeline as a landing page. One of the most important thing is the new cover photo, which make new opportunities for all the brand pages. The goal here is to show emotion and what your brand is, no need to put (again) your logo or be too much advertiser (it’s forbidden anyway). The photo size is 850px wide and 315px height. Google+ is it a ghost town ? Google+ has a successful launching, with today more than 90 millions of users. Thanks to a good buzz in the beginning and a very good integration to the others Google services, Google+ still expect to reach 400 millions of user by the end of the year. The problem seems that users don’t really use the product. 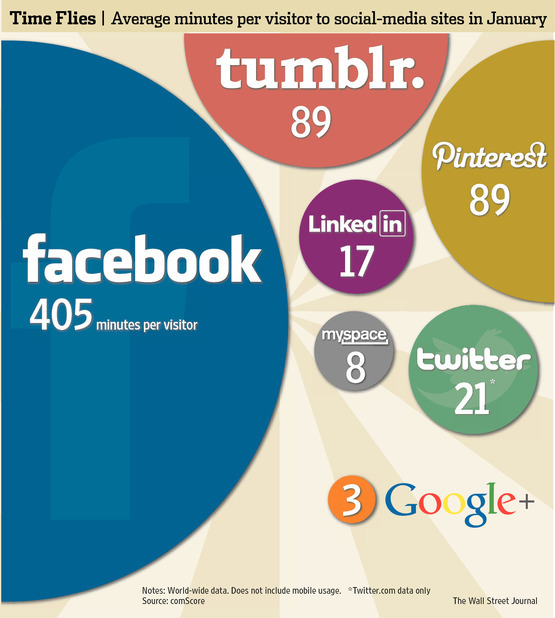 By focusing too much on the users amount, Google+ still doesn’t find a right positioning between Facebook & Twitter. If there is no reason to stay, users don’t… That’s why Google+ is way behind all the others social networks by counting the average time by user on in January. Brands and companies (as users) don’t invest time on because they don’t see what value-added bring Google+. 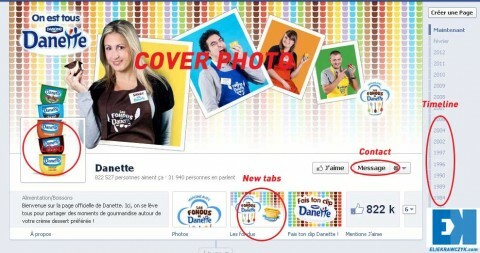 You want to change your avatar in Facebook or Twitter ? 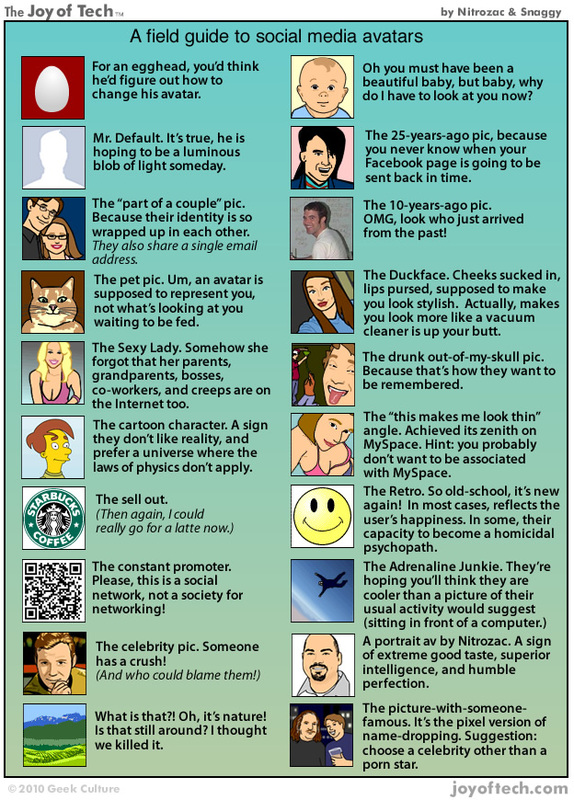 Before that you should check this “guide” made by Joyoftech. (Almost) true and funny.